AB 1300, recently introduced by Assembly Majority Leader Ian Calderon, would bring the success of the California Film & TV Tax Credit Program to musicians and the scores that are an integral part of every motion picture and TV project. The California Music Scoring Tax Credit bill would significantly raise the credit for motion pictures shot outside of North America. It would require the California Film Commission to allocate a credit amount for post-production music scoring or recording in an amount equal to 30% or 25% of qualified expenditures attributable to the production of a motion picture filmed outside of California if a specified number of employees are employed and at least 75% of the music scoring or recording occurs within California. It would also provide a new low-budget provision that would qualify projects $5 million or under to a scoring credit, regardless of filming location. An attractive aspect of the bill is that funding for the bill would not come from new tax dollars, but rather from the reallocation of previously dedicated credits. AB 1300 is endorsed by a growing coalition of musicians, film and television composers, and organizations including AFM Local 47, San Francisco Musicians Union Local 6, American Federation of Musicians of the United States and Canada, The Recording Academy San Francisco and Los Angeles chapters, Recording Musicians Association of Los Angeles, Society of Composers and Lyricists, Los Angeles Chamber Orchestra, Pasadena Symphony and POPS, United Teachers Los Angeles, and National Association of Broadcast Employees and Technicians–Communications Workers of America (NABET-CWA) Local 53. 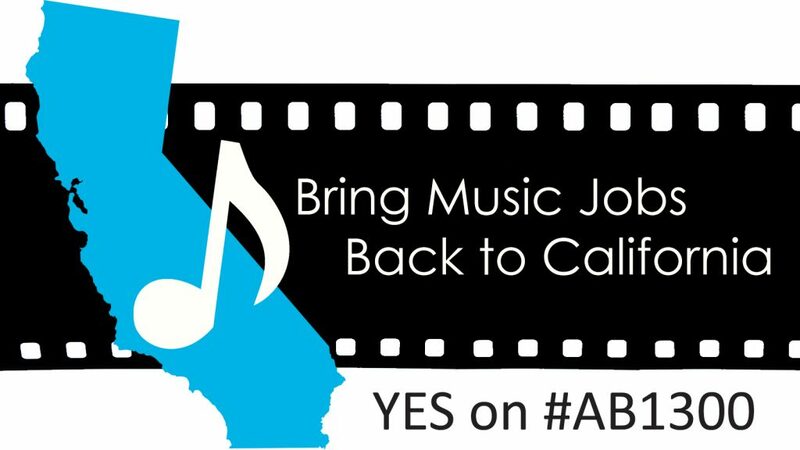 Proponents of the bill are actively meeting with local legislators and community leaders to ensure that music scoring work returns to California. Discussions are currently ongoing with the offices of the mayor and governor of Los Angeles.